To follow me on Patreon, you can go here and check it out. There are a variety of support levels, including $1 and $3 levels for folks who just want to be supportive but don't have much of a budget, as well as levels that get you rewards like a spell a month, or snippets of my works in progress, and much more. (There is even a level that can get you a live tarot reading every month or help with your own writing!) Plus exclusive cat pictures, of course. Mostly, Patreon is a way to support the artists/authors/creative folks you like, so they can keep on doing what they're doing. And believe me, we appreciate it. I hope some of you will join me at this once-in-a-lifetime class! I've been working hard on the third Rider book, DANGEROUSLY FIERCE. Expect some big announcements soon! I'm going to be heading to Daytona Beach, FL in February, to be a Featured Author at the Coastal Magic Convention. I'd love it if you could join me! We'll have lots of fun panel discussions, time for meet & greets and casual chats, and a whole slew of other activities. There will even be a chance for some lucky readers to join my table for lunch before the book signing! 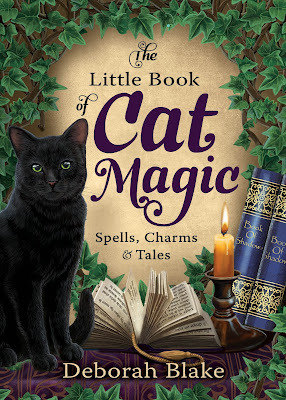 Check out the website at http://coastalmagicconvention.com/ for a listing of my fellow Featured Authors, and lots of other info. Then, get yourself registered for a weekend of bookish shenanigans by the beach! 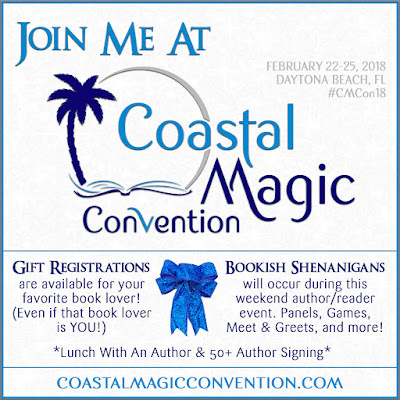 (And, if you mention me in your registration, for "how you heard about Coastal Magic", you could help me win an awesome author prize!) I can't wait to see you there!! As you know, I lost my beloved brother and sister cats, Mystic and Magic, within nine days of each other recently. To say that I am grieving would be a huge understatement. My house, which until a few years ago, had five cats in it, only had one. Not only was poor Angus not made to be an only cat (he has always been with other cats, first at the shelter and then here, and was often curled up on the bed with his buddy Mystic), but I was pretty sure they were going to kick me out of the Crazy Cat Lady Union. Normally, I wait a bit longer to get a new cat after losing one, but the house was SO DAMNED EMPTY. 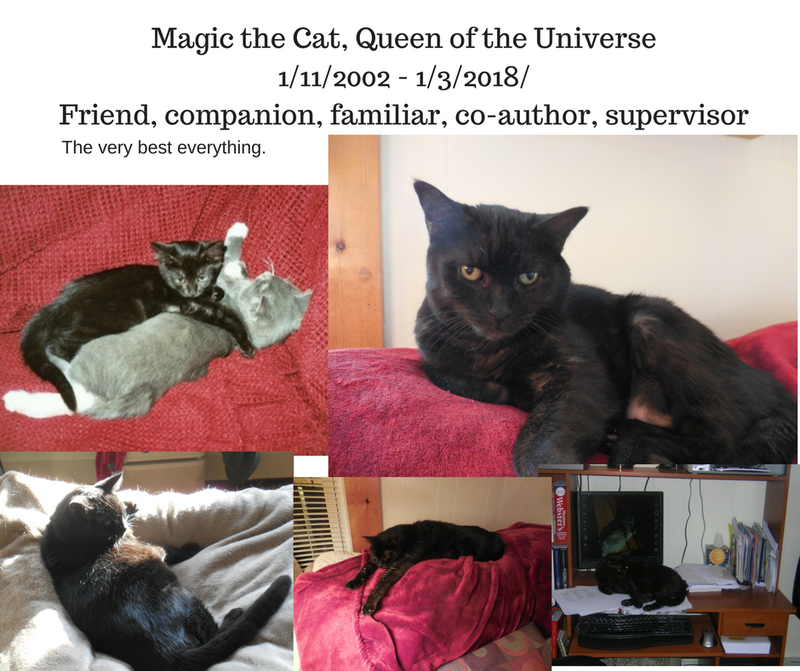 After Magic died, I had already started looking for new cats, although at the time I had planned to wait until after Mystic was gone, not realizing that would happen so soon. I happened across a cool local rescue organization called Super Heroes in Ripped Jeans when my friend Ellen and I were at the mall one day and they were there with a bunch of cats. These folks do spay and neuter and find foster homes for both cats and dogs until they can be adopted. They're completely made up of volunteers and funded by donations. So I thought I might look for a cat with them instead of the shelter, when it came time. After I lost Magic, I looked at their pictures of adoptable cats on Facebook and saw a little 4 1/2 month old guy named Ocean. He was black, and the ocean IS my happy place, and I had asked Magic before she died to help me find my next kitties. So I went to go visit him at his foster home. He ran around for a while with the other kittens there, and then tried to get into the pocket of my coat where it was lying on the floor. His foster mom Kristen and I joked that he was trying to go home with me already. 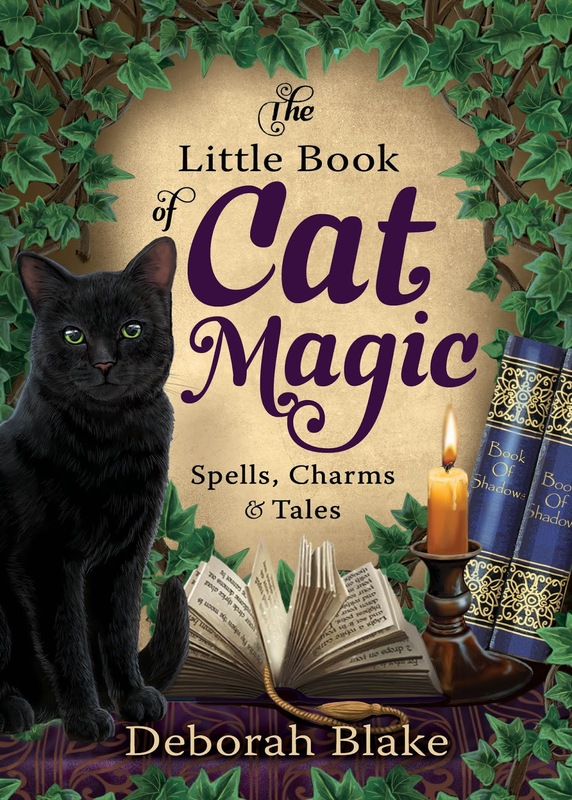 I explained to her that I really wasn't sure what was happening with Mystic, and I had another couple of cats to see that my friend Nancy had found, so I couldn't promise to take him. But it looked pretty possible, since he was a very sweet boy. Then he came over, sat on my lap, and promptly fell asleep. I know when I've been chosen. Here is a picture of me with him. I look terrible, because I'd been weeping for days. But he looks cute. When I had to put Mystic to sleep the following Friday, the house was so unbearably lonely and empty, I actually went and picked up the then-named Ocean that evening. Luckily, I had already been approved for adoption. He has been adjusting well, all things considered. He's a bit mouthy, and has a tendency to get into trouble, but he is also sweet as can be and there is no one you would rather have by your side when you're feeling sad. So in keeping with the magical theme of the household, and in honor of one of my favorite fictional wizards, he has been named Harry Dresden. Angus spent the first few days hissing and running away, but they are slowly getting used to each other. I think it is going to work out. Harry Dresden turned five months old on the fifteenth, and it is um, interesting, getting used to all that wild young energy after having a house full of older cats for so long. He has two seven month old companions who will be joining him at the beginning of February from a different rescue organization (seriously-- Crazy Cat Lady Union rules!) and hopefully they'll all wear each other out. In the meanwhile, say hello to Harry! What do you think? Does that black cat remind you of anyone? I had a lot of fun writing this one, and it is going to be my first HARDCOVER book, so I am pretty excited! It has been a rough week. 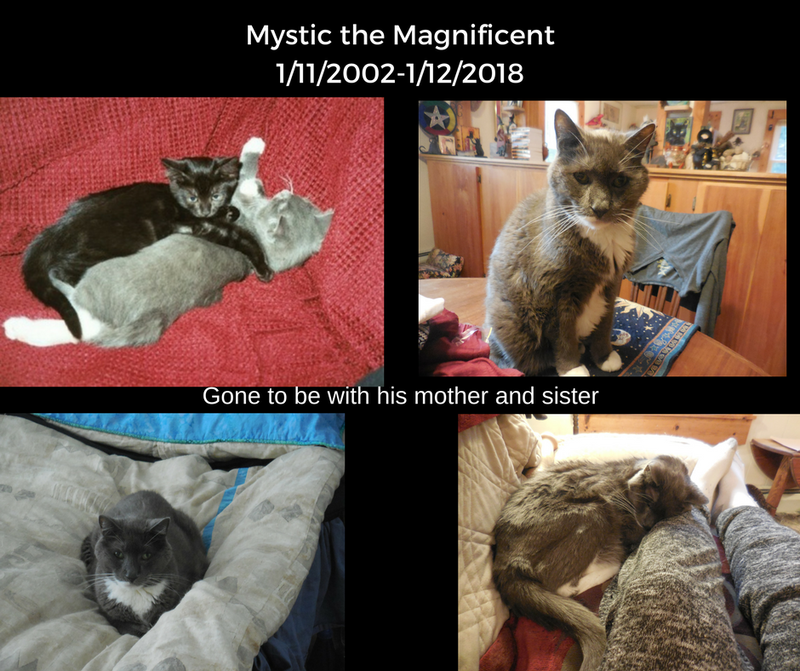 I lost Mystic yesterday, nine days after his sister. He'd been fighting lymphoma since March and had already been going downhill. Once we lost Magic, he stopped eating almost entirely. When I brought him in on Friday, his weight was down to 9.3 lbs (from 16.8 originally--he was a BIG cat) and my vet said it was time. But it was SO hard to let him go too. I'll be back with more cheerful news soon, I promise. It actually went as well as it possibly could have, under the circumstances. Heartbreaking, of course, but Magic—in her usual inimical fashion—made it clear that she was ready (while I was making breakfast, she walked into the kitchen, yelled at me, and then walked back into the living room to stand in front of the carry case where it was warming up in front of the pellet stove—of course, then she went and hid behind the couch and made me move it to fetch her out). She even sat next to me on the couch as I ate breakfast, purring and letting me pet her, which she hasn’t wanted much in the last week. The folks at the vet’s were great, she clearly wasn’t afraid or upset, and my friend Ellen stepped away from her dog grooming in the back to be with me, which really helped. It felt like things had come full circle, since Ellen had found Magic, her mom, and brother for me all those years ago. Magic’s passing was gentle and peaceful and I was there with her (which might not have been true if that tumor had burst) and my vet agreed that we were seriously out of time (the tumor was so huge, you could see it pushing out her sides). I am bereft, but I also feel like I made the right choice for the cat—for the first time ever in all the years I’ve had them, I picked exactly the right time. So in a way, we actually beat the damned tumor at the end. I’d asked for her to make it through the holiday season, which should have been impossible, given the size and volatility of the cystic tumors on her spleen, for her not to have a crisis while the vet was closed those extra days and to allow me to do what I needed to do at the shop. We had the long weekend to say our goodbyes, and she was so clearly ready to go. It was as good as it could possibly have been, for something so terrible, and my grief is tempered by gratitude for a kind universe and a stubborn-to-the-end cat. But oh my goddess, how I miss her already. Then in the early afternoon, my friend Ellen (who found me Magic, along with her brother Mystic and mom Minerva almost 16 years ago) came over for a low-keyed New Year's celebration geek style: Chinese food, Scrabble, and watching this year's Doctor Who Christmas Special (which I had gallantly held off on watching so we could do so together). We got Peking Duck, one of our favorites, and Magic happily nibbled on a bit of duck meat. Peking duck? Well, maybe just a bite or two. The Doctor Who episode was actually pretty terrific, and it was nice to share it with Ellen. Magic spent most of the meal sitting next to me, although she quickly got bored with the duck. She always supervises everything I do, from eating to writing. Not sure how I'll do either without her. Yes, she IS the boss of me. Eventually she wandered off to sit on the bed with (but at a reasonable distance from) her brother and his pal Angus. We play nine letter Scrabble, so we can get even more vicious and make even longer words. I hope your first day of 2018 was a good one, and that if, like me, it is starting off tough, it gets better as it goes along. I am looking forward to sharing mine with you in the days to come.